You must already have an account on QuestormPublish. To request one please send an email to questromhelp@bu.edu requesting one. Note: If you are outside the BU Campus, first use VPN to connect to the BU Network, then follow these instructions. Open Taskbar and Start Menu Properties by clicking the Start button Picture of the Start button, clicking Control Panel, clicking Appearance and Personalization, and then clicking Taskbar and Start Menu. You should see a list of Folders. Browse to your folder (e.g. SM299.) To edit a file, copy it to your own machine and open it using a web authoring tool. 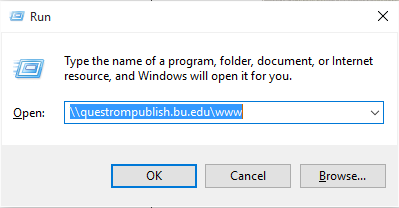 To upload a page to QuestromPublish, copy it from your machine to the appropriate folder.